In the early morning hours of December 18, 2014, a major fire broke out at the Falkensteinerhof, situated on the outskirts of Konz-Niedermennig, and destroyed much of the historic manor house (which is depicted on the label of the Weber family's Hofgut Falkenstein). A total of six people were injured, two of whom were severely hurt. Firemen from Konz, Saarburg, Kell am See, and Trier quickly came to fight the blaze that started in the library of a 73-year-old emeritus professor of regional history at the University of Trier. He had close to 17,000 books, including many old ones on the history of Saar and Mosel wine. His library was located below the turret that has since collapsed in the fire. On my photo, the Webers’ residence is to the left and has only damage to the roof and from the extinguishing water. Their neighbor was less fortunate. It's unclear if the entire main building needs to be demolished. Johannes Weber, who came home late in the night and was about to go to bed, smelled smoke and heard a commotion coming from the library next door. His father, Erich Weber, smelled smoke as well. Johannes ran barefoot to his neighbors to try to help extinguish the fire, before the firemen came to the site. But it was too late. In the library, the tens of thousands of books and scripts were like briquettes. Fortunately, about 120 firemen could keep the fire from spreading to Weber's home. "A westerly wind from Konz helped, too," Erich Weber says. He and his wife, Marita, watched how the books went up in flames and the fire destroyed much of this landmark building, which they and their neighbors bought in 1985 and began renovating little by little over many years. The cause of the fire is not known. On the opposite side of the courtyard, the press house, which is on a gentle slope, and the deep cellar below are intact. 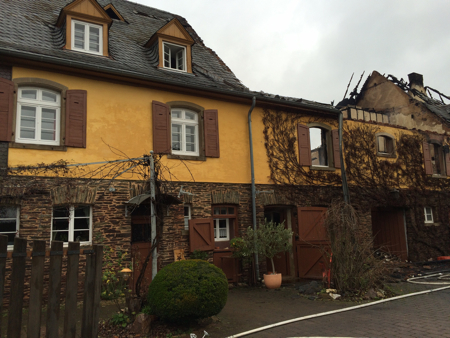 The fire didn't reach this building, and the wines in the cellar are fine. Yesterday at noon, I visited Falkenstein and talked with Erich, who, despite the circumstances, was in good spirits. Many of the firemen remained at the property to make sure that glowing embers didn't catch fire and cause more damage. The Weber's house is still standing, but they will have to live in Erich's home village of Krettnach for the time being. The Webers of Hofgut Falkenstein appreciate the outpouring of support. I've received a lot of phone calls, emails, and text messages asking about them. It's much appreciated after this catastrophe. The Weber family is strong-willed. Despite the setback, they plan to continue on. In addition, Johannes phoned me yesterday afternoon, after being released from the hospital, and said that they had saved an old document with the building plans of Falkenstein. As many of you know, I not only represent their wines, both here and abroad, but I also feel a close attachment to Hofgut Falkenstein and the Weber family. Yesterday, at two in the morning, I happened to be up late drinking a glass of Falkenstein's 2013 Niedermenniger Herrenberg Kabinett trocken and didn't know that, at the same time, the building had gone up in flames. It was a shock when my aunt phoned me later on with the bad news. As my former colleague at Mosel Wine Merchant Dan Melia says, "Christ, my first impulse is just so irrelevant-feeling: that the wine world should come together to make donations. But the bigger thing is: has there ever been a family that's put more love into a piece of property than the Webers?" I think anybody who has visited Falkenstein feels the same way. Thanks to the professor, I read in one of his books an academic paper, by Andrea Fleck, on the history of Weingut Falkensteinerhof. Trier's Friedrich-Wilhelm-Gymnasium (FWG) began to build the manor house for this Saar estate outside Niedermennig in 1927. It was completed the following year. In fact, on top of the spire was a heavy metal flag with the date 1928. The cellar, on the other hand, was built years before, when the first vineyards were planted here. One of the large stone signs on the property has the name of FWG's "de Nysberg" and "1903." The other two stones are on opposite sides of the entrance to the courtyard with the name "Falkenstein" and "1901," plus "Friedrich-Wilhelms-Gymnasium." In other words, the estate was established in 1901. Other Saar properties, like Schloss Saarstein, were built at this time as well. It should be noted, too, that de Nysberg is both an "estate" and a vineyard, but it was managed under FWG's Falkenstein back in the day. On the fourth edition (1906) of Clotten’s 1868 Saar and Mosel map, it only lists de Nysberg. The Gewannname, or place-name, of de Nysberg is only a small section of the present-day Falkensteiner Hofberg and is located in the far corner near the woods. As of today, Johannes says that the elderly woman remains in critical condition, but the professor is doing better. When I first heard the news of the fire in the morning, I couldn’t believe it. My aunt drove me to Falkenstein at around noon. As we descended down the muddy path, many of the firemen were still there. I got out of the car and walked over to console Marita and Erich. At the time, Johannes was still in the hospital. Erich later took me around to the courtyard, where more firemen were standing. Some minutes later, a reporter came up to us. She wanted to interview me first. I declined. It didn’t feel right. I, however, took a few photos of the main building. On that day, I refrained from tweeting and posting on social media, but I realized that something needed to be done. Very sad news, Lars. My thoughts are with the Weber family, as well as the woman and the professor who were injured in the fire. Thanks, Andrew. Johannes came by my flat on Friday morning. His family is doing well, considering the circumstances. The professor and his mother-in-law are still in the hospital. Sadly, the Franz Irsigler’s 87-year-old mother-in-law, Annette Straubel, passed away early last month. Franz has scars on his hands from the fire.